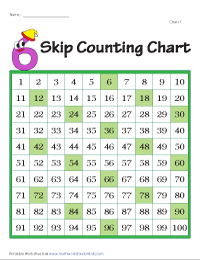 Skip Counting serves as a foundation for multiplication. 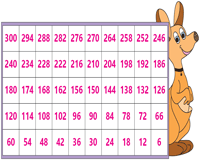 Worksheets based on number lines and skip counting with objects are exclusively available here. It also includes math activities like mazes and connecting dots. 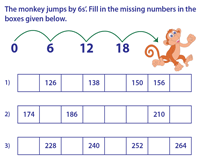 Practice skip count by 6s with these printable worksheets. Display charts are used as reference charts to learn skip count by 6s. In addition to that, partially filled and blank charts are available. 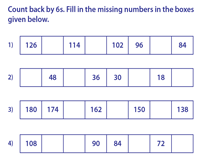 As a precursor to the skip counting exercises, observe and learn backward skip counting by 6s from the display charts enclosed here. 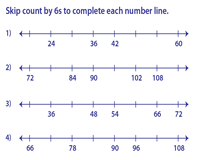 The number line will help the kids understand the skip count in an easier way. There are two levels in this section. Skip count by 6s with the objects that are used in day-to-day life. 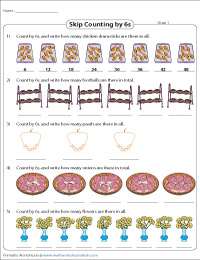 Find out how many are there in each set. Help Sara escape the haunted house and the girls reach the fun island. A template is also provided. The levels are classified into easy and moderate. In this section, snail theme is used. 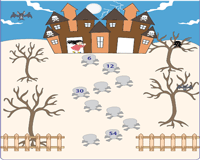 Skip count by 6s to fill in the missing numbers. Each worksheet contains five problems. The monkey jumps by 6s'. Fill in the missing numbers. The range of numbers varies from 120 - 300. 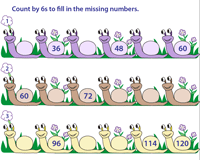 Count back by 6s to fill in the missing numbers. There are seven problems in each worksheet. 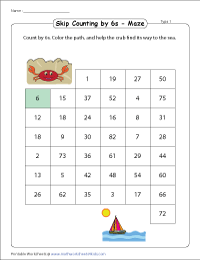 Practice skip count by 6s with these printable maze worksheets which have colorful themes and scenarios. 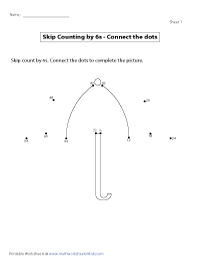 This section contains connecting dots worksheets with skip counting in 6s. Join the dots to reveal the hidden picture and color it.